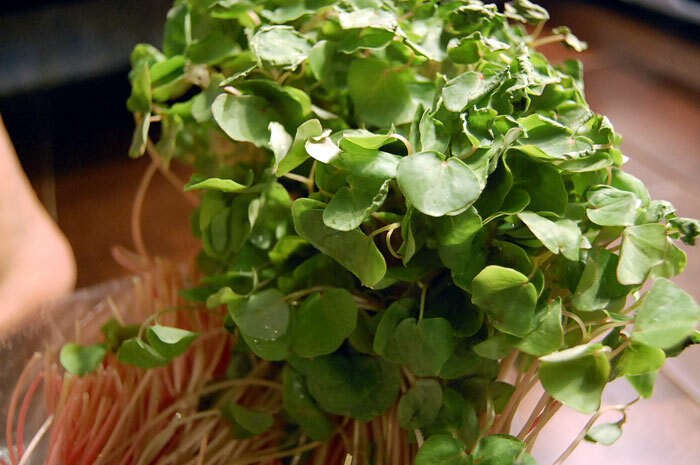 Trim off the ends of your sprouted buckwheat, chop the sprouts as long or short as you prefer and place the sprouts in a large salad bowl. Add the chopped spinach leaves and fill the bowl with water. Slosh the greens around to clean them thoroughly. Any dead leaves and dirt will rise to the surface. Do this two or three times until the water runs clear and drain the greens thoroughly. Chop up the tomatoes and add them to the greens. Next, the herbs. A trick I use to chop up my leafy herbs, like basil and mint, is to gather the leaves and layer them flat one on top of the other in a flower formation. Then, tightly roll up the stacked leaves. Chop along the rolled leaves about a millimeter or two apart, and when you unroll them, you’ll have a beautiful feathery fine pile of chopped herbs. Add this to the greens. If you are adding the mandarin oranges, add them in now. Also add fresh ground pepper and salt to the salad according to your taste. Mix the salad thoroughly with salad tongs or your hands. 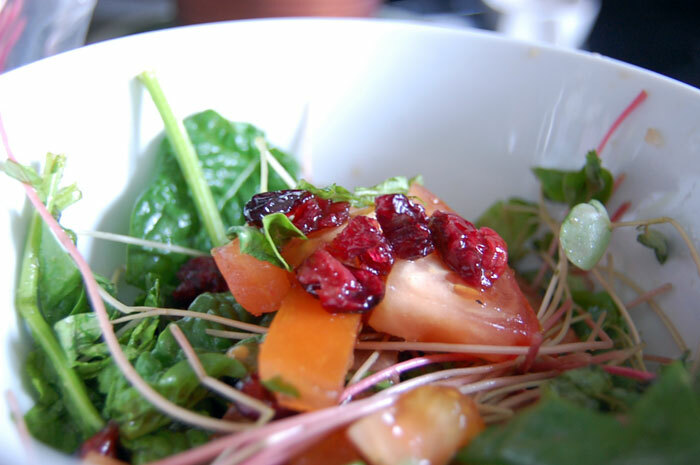 Sprinkle the dried cranberries over the salad (and pine nuts, if you’re including them). Once you’re ready to serve the salad, drizzle the olive oil and balsamic vinegar over the salad and give it one last good toss. This entry was posted in Salads, Sides, Starters, Vegan, Vegetarian and tagged salad, spinach, spring, sprouted buckwheat. Bookmark the permalink.